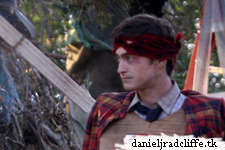 Daniel has been filming Swiss Army Man since 14th July, starting in San Francisco. Ability Films did put a set of photos online which were taken on 7th August in Malibu California. Edit: Looks like Daniel is playing the 'dead body'.